Image of Shokalskiy from Aurora website today. is being withdrawn effective immediately. QUESTIONS over the continued operation of adventure cruising specialist Aurora Expeditions have been addressed by the cruise line, with a spokesperson telling Cruise Weekly that the company has made an early cancellation of its short term charter of the vessel Akademik Shokalskiy which was due to run until March 2013. 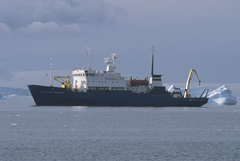 Akademik Shokalskiy joined the Aurora fleet in 2011. Although the spokesperson did not comment further on the charter, the company did say that despite the cancellation, it will still continue operate its traditional program of voyages to Scotland, the European Arctic, Antarctica, the Kimberley Coast and Papua New Guinea in 2012/2013. Stay tuned to CW for more Aurora updates next week.